This price action indicator automates the detection of trend breakout patterns and retest breakout patterns. It generates trade signal with analytical entry, stop loss (SL) and take profit levels (TP1 and TP2). Can analyse any financial market (currencies, cryptocurrencies, stocks, indices, commodities, bonds etc) instrument and time frame. Notifies through pop-up, push and email when signal is detected and the stop loss and profit levels are reached. You can receive push and email notification of signals from your MetaTrader 4 on a Virtual Private Server(VPS). Quantitative analysis and display of the strength of detected patterns by looking at the interaction of supply and demand over time. Can be set to only detect high take profit to stop loss pips trade signals. It provides clean, simple and colour-coded display (to show whether a pattern is bullish or bearish) that can be automatically screenshot and saved to your PC. - Improved pattern strength algorithm. - ‎Improved take profit and stop loss algorithm for range patterns. 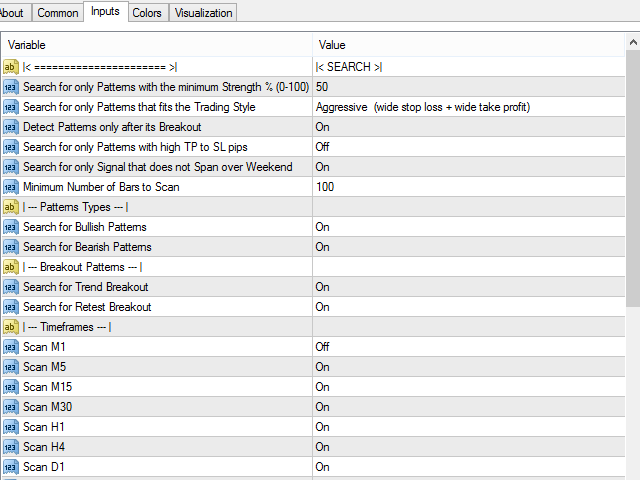 - Added pattern strength settings. - Option to take screenshots for all notifications added. Screenshots will be saved to: MQL4/tester >Files > TR Breakout Patterns Scanner (in the terminal menu select to view: 'File' -> 'Open Data Folder'). Basic bug fixes and improvements.